Koi ponds add beauty and grace to any backyard, transforming an ordinary backyard into a personal paradise. In our busy, hectic lives we’re all looking for ways to decompress. After a hard day at work comes more work preparing dinner, driving the kids to practice, homework, bath time. What about ME time? Imagine when the day is done how nice it would be to grab your partner, a couple glasses of wine and relax by the pond. Listen to the water rippling over the rocks; watch the breeze cascading through the rushes as the dragonfly’s glide along the top of the water. What a perfect end to a long, hard, day! Or how about spending a lazy afternoon in a hammock out by the pond reading that great novel that you’ve always meant to read? Koi fish ponds are great for children too. Japanese butterfly koi are friendly, intelligent and will develop personalities. Koi are easily trained, and are gentle enough to be hand fed. Imagine what a thrill your little ones will have hand feeding the koi, or dipping their toes in the pond while the koi swim up and take a little nibble. I can just hear the giggles! What a great way to spend quality time with family while teaching your children love and respect for nature and the world around them. A koi pond is different from a water garden because koi will affect how many aquatic plants you can put in the pond, as koi sometimes like to dine on pond plants. A koi pond is typically larger because koi can grow quite large, acclimating to the size of the pond, therefore a koi pond should be no less than 1,000 gallons. It also needs to have an area of the pond at least 2 feet deep. An ideal koi pond will be functional as well as aesthetically pleasing. There are multiple factors that must be considered when designing a water feature. The most important elements in aquatic pond keeping include quality materials such as a pond pump, filtration system, pond skimmer and rubber pond liner. It is imperative to have a good filtration system as this is a major contributor in maintaining the ecological balance of the pond. At Sublime Water Gardens we use the highest quality products available and we only use “fish safe” underwater sealant. Once your koi pond is installed you can begin to accessorize. 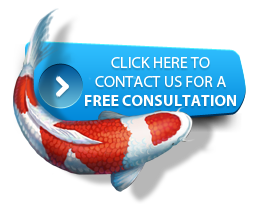 We have a wide variety of Japanese koi, goldfish, aquatic plants, multi-colored underwater lights, solar fountains, pond covers, and algaecides. We also carry several different items for predator control to keep your fish safe. 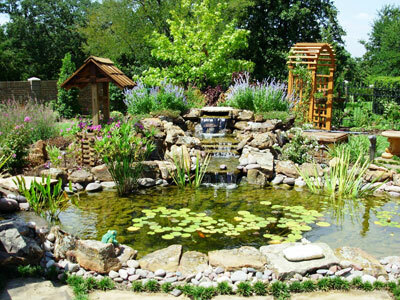 Sublime Water Gardens is a full service company and can help you with any of your pond needs. When you’re ready to change your yard from the “run of the mill” into the ultimate backyard paradise gives us a call. We’re sure Sublime Water Gardens will be the right choice for you.